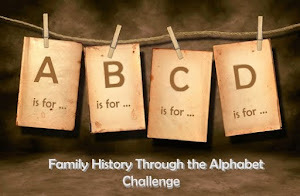 This week I am dedicating my Family History Through the Alphabet Challenge to my grandmother's gloves. That's a strange topic, you might say, but read on. There is a story to everything if you look closely enough. 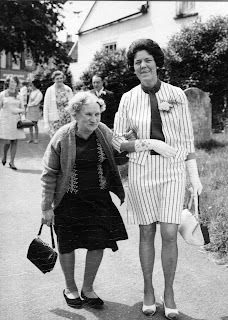 My grandmother Lilian spent most of her life in poor health. As a young child she contracted tuberculosis, while bronchitis and asthma plagued her adulthood. Despite this, Lilian had a glamorous spirit and this is my fondest memory of her. She had style and she carried herself as though she possessed tons of it. Some may argue that she was above her station in life but I always liked that about her. She rose above her illness. Lilian always wore gloves. She also smoked cigarettes from a black holder (which I tried to emulate once and only ended up looking like a right fool). She may not have been Audrey Hepburn either but, to me, she was pretty darn close to it. 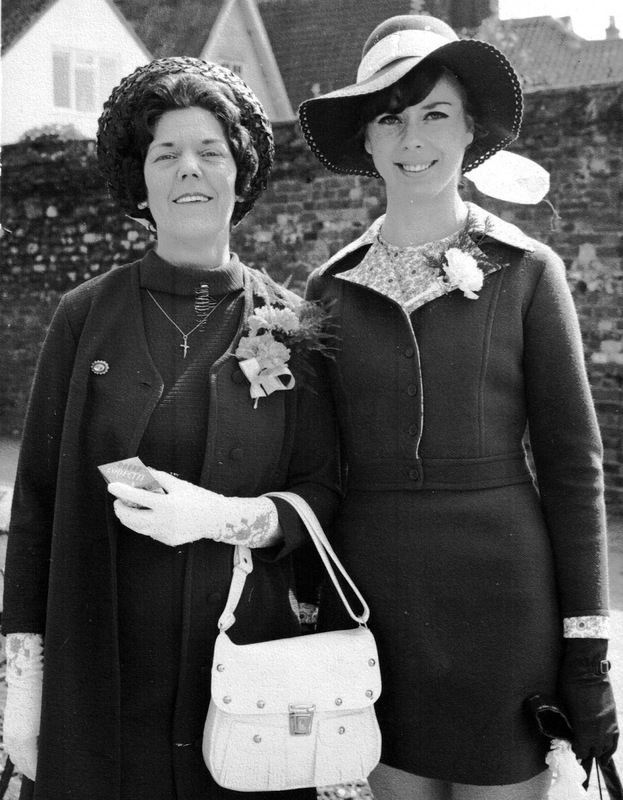 Every photograph I have of Lilian, taken at a family wedding, she is wearing gloves. She had many pairs in all lengths, styles and colours. When she passed away I was given a pair of her gloves and I still treasure them to this day. 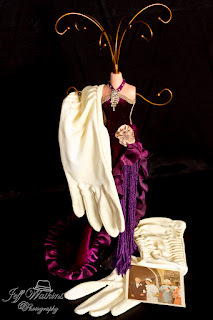 They are ruched at the wrist which is my favourite style of vintage gloves. I used to wear them in my younger years but nowadays they are kept in my treasure box for safe-keeping. Even my mother wore gloves well into her thirties. I remember she had a short navy blue pair which she always wore in the winter months when driving. While gloves have always had a practical nature they also began to develop symbolic meanings. It was good social etiquette when approaching a person of high authority to remove the right hand glove as a mark of respect. The same was also true for approaching an altar. A lady could show her affection or favouritism to a man by taking off her glove and offering her hand to him. In Freemasonry the glove plays an important symbolic role. 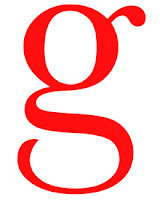 Freemasons believe that the glove alludes to the purification of life. They quote Psalm 24:4 from the Bible "He who has clean hands and a pure heart"
The tradition of wearing gloves for Holy Sacrament by Roman Catholic Bishops became a religious ritual and as early as the 10th century, to keep their hands clean, Popes, Cardinals and Bishops wore gloves. Kings began to wear gloves as part of their ceremonial duties and later as more of a fashionable accessory to display their position. My grandmother's gloves hold a very special meaning in my heart because my grandmother was special, and because I associate vintage gloves with her. Whenever I go to a vintage clothes market I feel as though I am stepping back in time and seeing my grandmother's world as she would have known and loved it. Gloves, hats, handbags, scarves, brooches, feathers, and long coats. Even through the London Blitz, my grandmother still held her head high. She really did "Keep Calm and Carry On". How beautifully stylish your Grandmother looks in every photo. I never knew all that about gloves. I wore white gloves to church when I was quite young but haven't worn them since. I love your post, not just because it is about gloves - something I wouldn't have expected - but because you've conveyed the deep sentiment of them to you, in your post. You're lucky to have such a very special heirloom to treasure.